As the epidemic of type 2 diabetes sweeps across America, it has become ever more important for team-based care to take care of our diabetes patients. Welcome to Diabetes Discourse. I am your host, Dr. John Russell. Today’s topic will be the Healthy Journey of the Type 2 Diabetes Patient. I am joined today by Dr. Candis Morello, a Certified Diabetic Educator and pharmacist. Candis, welcome to the show. So, with all the increases in obesity and diabetes are you that much busier now? Absolutely, I am a clinical pharmacist and I work collaboratively in an endocrinology clinic where we see very complex patients with type 2 diabetes. And as obesity is very common in type 2 diabetes, I would definitely say over the last 5 years or so the numbers of patients in our clinic has continued to grow. So, for the average patient who shows up as a new patient, what do you think are their biggest misconceptions about diabetes as a disease? And the clinicians who refer in to you, what do you think are the biggest misconceptions of the referring clinician about diabetes? A lot of times they get a perspective that it’s difficult to get patients to use injectable agents, such as insulin or GLP-1 agonists. So, a lot of times what I notice is the patients who come may be on one or two oral medications and then when it comes time to start an injectable medication they send them to my clinic because I think truly that there is a misconception that it is difficult to start – let’s just use insulin as an example – because it requires more monitoring, it requires more glucose, touch thing (2:47) of glucose and a little bit of followup with the patient in titration. You know that’s primarily the one that comes to mind, and the second is that you get the impression that they feel that it is difficult to motivate patients to take interest or to want to control their diabetes. And I think probably one of the things on my end, as a primary care doctor, kind of the, you know, we threaten patients with insulin like we threaten our kids. You know, “Don’t make me put you on insulin.” And probably that doesn’t kind of make a patient feel really excited about going on insulin or some injectable if I have already kind of -- if I have kind of set the stage for them coming to see you -- that it is a punishment. And you know, sometimes when they walk in I feel like, they feel like they have been a bad child kind of thing, and I say to them, “Oh no, you are here because we are going to help you, give you tools that completely take care of control of your diabetes.” And so much of the times the patients come with this feeling that this diabetes has complete control of them and we just flip that around. We put the patient in charge. We give them tools. A lot of times we use insulin and there will be patients who are completely adamant that they do not want injectables, they do not want to test their glucose. But if you find the carrot that motivates them, like “what’s the carrot” is what I call it. So, what’s going to make them change? And sometimes it is how many times they have to get up to go to the bathroom at night. Sometimes it is how it impacts their job or how if they have erectile dysfunction or they can’t dance with their wives because they have such bad neuropathy in their feet. But when you find what that is, and you say, “Hey, if I put you on insulin, I’ll tell you what, in 2 to 3 weeks you are going to be feeling so much better.” And once they figure that out and it is very true, we just titrate them up over a period of 2, 3 weeks and they feel so much better and they are thrilled, and they don’t mind the insulin or injectable agent. Isn’t that the concept of motivational interviewing? Right? So probably when you are talking about the motivational interviewing in your practice, probably often times you are starting with diet, right? 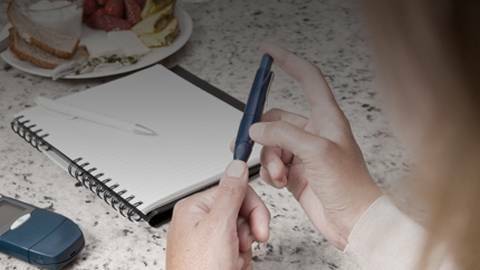 So what are some of the key concepts that you think for our listeners are some of the most important things to convey to their patients with type 2 diabetes about diet? Absolutely, I feel one of the most important things is the quality of the food that people eat and also the quantity. So, the quality, I am a big believer in adding fiber to the diet. I think that it helps with not raising the postprandial glucose concentrations as high. And so, I immediately when patients come into clinic, we slowly titrate up their amount of fiber in their diet, either naturally or we also use like a Benefiber sort of thing and most of my patients drink coffee or tea or something in the morning, and so, I just have them add some fiber to that, you know and then they have their breakfast. Or, we talk about how they can add fiber in their diet just about their food choices. And then the other is the timing of the food. You know, I always have them eat the fiber first. So, if they are going to go out to dinner and order a meal, then we have them obviously select lean meats and lots of vegetables, but before that they will have a salad and that helps them feel fuller faster as well as reduces the time for absorption of the glucose so they don’t peak so high. So, how important do you think is carb counting? And when you are talking about carb counting, are there any tools that you use to instruct patients? Okay, well I am glad you asked that. Most of my patients I treat have type 2 diabetes. So I find that carb counting is very confusing to patients and that is just my own personal perspective of what I’ve seen over all these years and instead of using carb counting, I actually use, you know, again that goes back to the quantity, I use their hands and their fists to show them how much a carbohydrate portion is. And so, what we do and, you know, everybody’s fists are a little bit of a different size but we compare it and we find out how much is about a carbohydrate portion for them. And that’s easier for them to do, is look at their plate and say okay, “I have 3 carbohydrate portions right here.” You know they don’t need to use math, they don’t need to know what amount of carbohydrate exactly is in everything, so I use the amount of it. And another tool is, I just have them use, suggest to them, that they use a dessert plate instead of the dinner plate. And the patient’s feedback has been that that helps them a lot to kind of have a little better idea of how much they are eating. You are listening to Diabetes Discourse on ReachMD. I am Dr. John Russell, and we are discussing the Healthy Journey of a Type 2 Diabetes Patient with Dr. Candis Morello, a diabetic educator. So, Candis, what is your overall approach to self monitoring of blood glucose? What I found with patients is, because a lot of times they are sick of poking their fingers and they just don’t really like doing it, but if I describe to them the purpose. You know that knowledge is power for them and that’s another way they can control their diabetes, and I help them make sense of what those numbers are, because again, a lot of times the patients will come to clinic and kind of give you – if they bring their log book you know, or if they bring their monitor you look at those numbers and they just kind of say, “Here they are.” Well, but what did they do in the two months since you saw them with those numbers? I am more interested in teaching them what to do with those numbers along the way because, as I have explained to them, as a clinical pharmacist CDE, I am not with them all the time. I am in my clinic helping patients or at the University teaching or whatever I might be doing. They are the ones making decisions day to day to day. So, I teach them pattern management, how to make insulin adjustments or changes in their diet choices based on those numbers and I teach them over a period of about a week’s numbers. And they go back and look at them and they can call me and they tell me what they are and we look to see and I say, “Okay, well what would you like to do? What are options of what you can do?” So, that is kind of my approach on educating how to do the monitoring, what the numbers mean and what to do with those numbers. So, I know there are a couple different guidelines for 2 hour postprandial sugars, where do you aim for your 2 hour postprandials? That’s a great question and that all depends on the patient’s glucose goals. So, if you have a patient whose fasting is about 80 to 130, then I usually use a postprandial of about less than 180, but a lot of my patients are, they have many comorbidities, microvascular, macrovascular and they are much older in age and have other issues that we would have their A1c goal to be perhaps less than 8, even in some cases less than 9. And so then my numbers shift a bit, and so I have them have a goal of between a 100 and 160 for their fasting and less than 200 for their postprandials. So, how do you approach starting insulin in a patient who has not been on it before? Yes, I basically tell them, usually they either know they need to start insulin already, or we just find the thing the insulin is going to help and a lot of time that’s energy, you know, they are getting up at night to go to the bathroom a lot or they are having no energy during the day and I tell them, you will feel better within a couple of weeks of starting this. So, I look at the patient’s perception of insulin and what we need to help them understand what the point of the insulin is. And we are so lucky compared to a decade or more ago. We have a lot of opportunities and options and choices in insulins compared to just regular insulin or NPH or so. So, we try to always start with a long-acting like glargine or detemir, NPH if we need to just at bedtime and because of the long duration, the kinetics of these longer insulin analogs, hypoglycemia is not as big of an issue. Granted, we teach the patients the symptoms and how to treat it and to prevent it but, you know really, you start slow and you kind of show them what the results are from increasing the dose and the patients can begin to see the benefit in their glucose values but also in the way they feel in a short period of time. Have you found that you are using a lot of the pen delivery systems for the insulins? I find that, I mean clearly, pens are more expensive than vials. What I find is for patients, the pens are very useful in patients who travel. I have several patients who travel internationally for their work or patients who work and are unable to bring their vial; it is more difficult or cumbersome for them to bring their vial and syringe to work, or patients who have dexterity issues. Those patients, the pen delivery system seems to be really helpful. The limitation I find with pen delivery systems is the highest volume that that pen can deliver at a time. To clarify, many of my patients require higher doses than the highest volume that that delivery system will deliver for one poke. And Candis, finally, how important do you think team-based care is for optimal care of our diabetic patients? I think team-based care is absolutely essential. We all have our expertise and perspectives and ways that we can relate to patients and I feel that is very important in managing our patients and that patients tend to do really very well with that sort of care. You have been listening to Diabetes Discourse, the Healthy Journey of a Type 2 DiabetesPatient with Dr. Candis Morello, a diabetic educator. Candis thank you so much for being on the show. Thank you so much Dr. Russell. Host Dr. John Russell welcomes Candis M. Morello, PharmD., CDE, FCSHP, Professor of Clinical Pharmacy and Associate Dean for Student Affairs at the Skaggs School of Pharmacy and Pharmaceutical Sciences. Dr. Morello explains the importance of patient education, communication, and motivation needed to instill a positive and healthy approach to diabetes care.